Please feel to share stories of your adventures here. Images are most welcome, but out of consideration for bandwidth, etc., please keep them to a reasonable size. 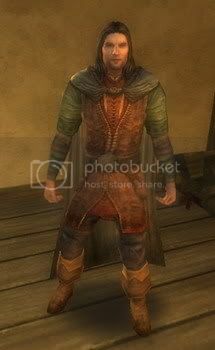 --leaving our fate in the hands of another fell servant of the Dark Lord, Sambrog the Wight-lord. Matched against so great a foe, what is a humble minstrel to do other than to start singing? Lucky for us, Old Tom was not out gathering water-liles for his pretty lady this day, and so was able to come to our aid. Weary from our battles, we paused for a moment to reflect on the day's adventure. 1. I should mention that Eriwyn did not physically embrace the Witch King nor did their lips ever touch. (Or so I presume, because I cannot actually see the Witch King's lips.) She claims she was blowing him a kiss goodbye before we sent him to the abyss prepared for his master. Knowing, however, that there are some ladies, who find the Witch King irresisitable (What did you think, Athelian, is the Witch-king h0tt? ), I always keep a few bottles of Athelas in my satchel should their passions be stirred beyond control. After all, it takes a lot more than a minty mouth wash to cure the Black Breath! 2. Prior to our fateful (for Sambrog) battle at arms, Eragwar challenged the Wight-lord to an arm wrestling match. (See the image above.) Sambrog declined, claiming that his bursitis was acting up. I don't mean to imply that Sambrog was chicken, but we did notice that he was molting. 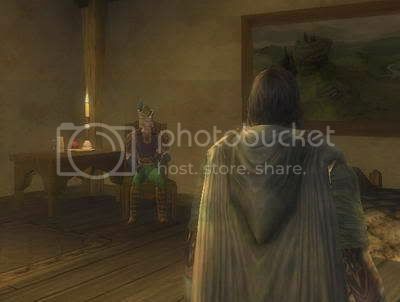 Now that I think of it, I never did find out who looted the [Beak of the Wight-lord] ? I understand that this item can be made into a musical horn by a craftsman with expertise in that field. Warning: Some parts of Curulinde's tales may be slightly embellished. The mark of a truly great minstrel is how cleverly he can embellish a story without making it seem completely implausible. At the end of a long day there is no sign more welcome than that of a comfortable inn where one may enjoy food, drink, a song or story or two, and afterwards, a soft pillow and a bed where may one stretch out one's weary arms and legs. 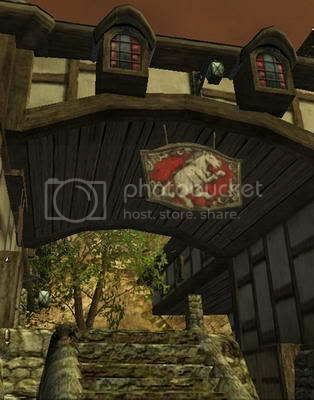 The Prancing Pony in Bree is a particularly popular place among battle-weary adventurers. 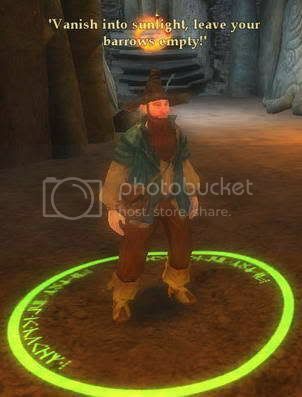 The innkeeper is a kindly, if somewhat absent-minded fellow named Barliman Butterbur. His ale, for those who enjoy a hearty brew, is particularly strong. 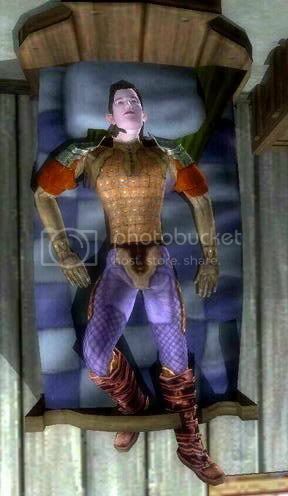 Strider is an Elf-friend fostered by Lord Elrond in Imladris after his parents passed. He knows many legends and histories of the Eldar. "The Song of Beren and Lúthien" is one of his favorites. Another frequent guest at the Pony is a wanderer dressed in grey. Mithrandir he is called by my people, but the Bree-folk know him as Gandalf. Do not let his frail and disheveled appearance fool you. Mithrandir is a great power for good in Middle-earth. 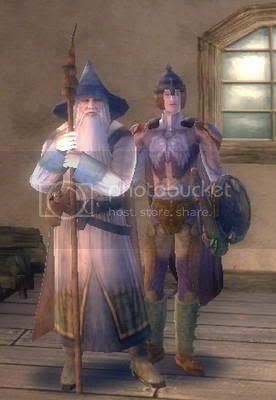 But Strider and Mithrandir have not been in Bree for some time, gone to places in the East, or so it's said, and the Pony is often filled with adventurers, craftsman, and performers from near and far. The Pony is so popular in fact, that it is often difficult to find the lodging that one prefers. Recently I have found myself lodged in the Perrianath Room, said to fit four comfortably. Athough the bed frames are old and worn, the mattress, linens, and pillows are all curiously brand new. I wonder why that may be? The room does indeed fits four comfortably, that is if you're no more than four feet tall. 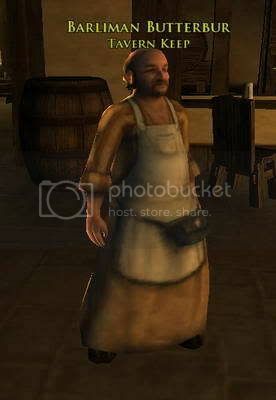 If one wants to RP the most common spot for that is the Prancing Pony in Bree. There are a few kinships that RP pretty heavily, but for the most part people do not RP, and it seems to me less so as time goes on. I do recommend staying in-character when speaking in /say, and most people seem to follow this unwritten rule.